Booking the gorilla permit in Rwanda can be done direct with Rwanda Development Board or through a Travel Agent. The Rwanda Development Board is the sole primary seller of the gorilla permits in Rwanda and it avails each permit at $750. Volcanoes National Park which is the only gorilla habitat in the whole of Rwanda has 80 gorilla permits every day. In the high season which is normally in the dry months, these permits can be sold off completely. Therefore, world travellers interested in Rwanda gorilla safari during this time require an advance booking of at least 3 months to avoid missing out. Is there any required degree of fitness for a Rwanda gorilla trekking safari tour? It can be noted that there is no required degree of fitness for any traveller intending to take up a trek to the Rwanda’s gorilla highlands. 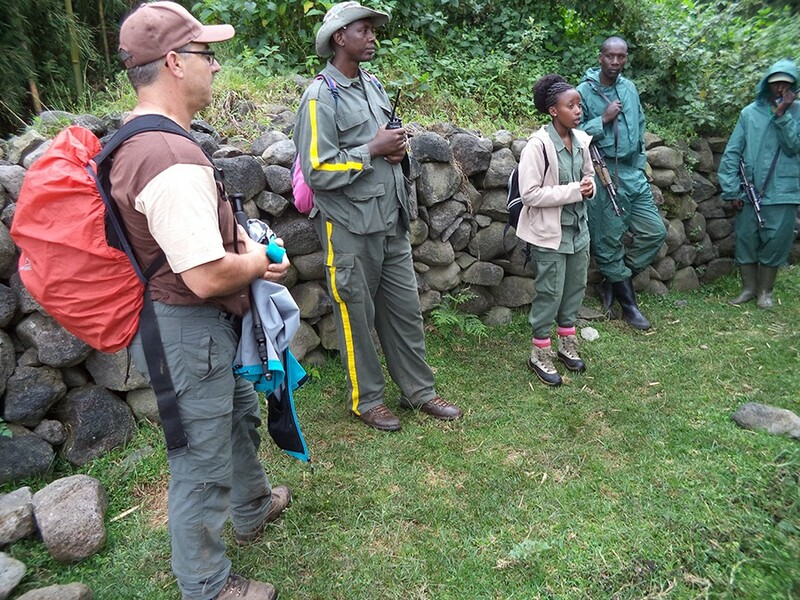 This is because during the gorilla tracking, the rangers always walk at the pace of the slowest person and breaks can always be made should there be need. In addition, there are easy to trek gorilla groups and if the traveller is not interested in extended treks, the guide can liaise with the park warden for a shorter and easy group to trek. But this depends on the discretion of the park staff and it’s not mandatory. The gorilla groups that thrive at raised slopes of the Volcanic mountains require some level of fitness as it would involve traversing steep slopes and jumping over some rocks before approaching them. Mountain Gorillas feature 98% DNA close to humans thus showing that they are susceptible to human transmitted infections. Additionally, the mountain gorilla population is low around 880 world over and yet their females can only give birth every after four years which indicates that their multiplication is slow. The Mountain gorilla habitat is very fragile and specific a reason why they are only limited in Bwindi and Virunga Highlands in Uganda, Rwanda and Congo on world scale. Putting in consideration of all the above, the range of gorilla trekking rules and regulations are put in place to maintain control of their interaction with humans. Only 8 people are allowed to track each gorilla group per day and the total time with the gorillas is limited to one hour. The person who is carrying a contagious disease like cold is required to stay behind as it can easily be transmitted to the Mountain gorillas. A minimum of 7m distance has to be maintained while with the Mountain gorillas to avoid contact. In the event of the gorilla approaching, the trekker is supposed to slowly step back to maintain distance and avoid contact. The Voices have to be kept very low while in the gorilla forest and avoid unnecessary movements while wit the gorillas. Eating while with the gorillas is prohibited and littering in the gorilla forest is strictly prohibited. The rain jacket, the hat and the Sunscreen to keep the body moisturized. Porters can assist with the heavy baggage including the Camera equipment. The porters are from within the local community thus by hiring them; you contribute directly to community development. Mountain gorilla photography is allowed but the use of flash light is strictly prohibited. The absence of flash can at times be a challenge when the gorillas are in deep layers of the forest where there is no enough light for the camera. The good thing with Rwanda is that unlike Bwindi Impenetrable National Park of Uganda, Volcanoes National Park features short vegetation that allows better photographic opportunities.